LIFE BEHIND BARS: SANTA'S HELPER, GOOD ELF! All the chocolate that was kindly donated by all the guys who came to ride at the Santa Cruise this year has..
...found it's new home just in time for Christmas. 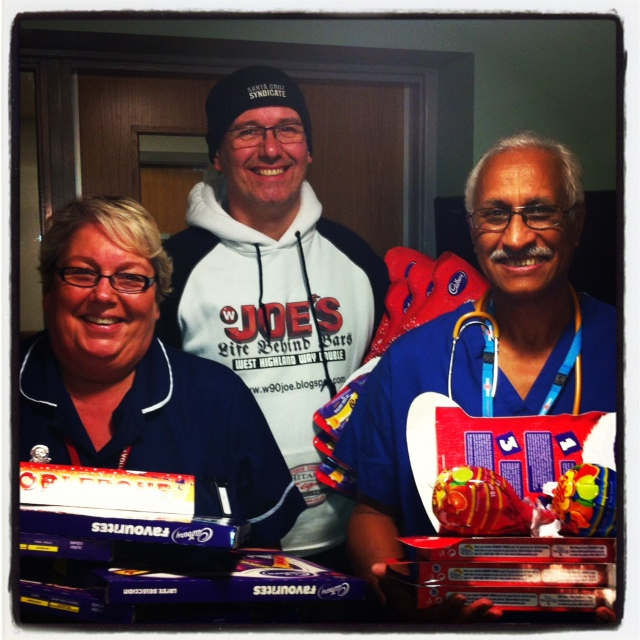 Mr Salamani and Jackie Danby were both on hand at Bassetlaw A&E dept to accept 50 selection boxes that we collected on the day to give to children who are admitted to hospital over the Christmas period, that should go a long way towards cheering them up. Mr Salamani is the surgeon I continually thank for rebuilding both of my thumbs a few years ago after a freak accident, without his skills I would not have them today, Jackie was also there to help on that fateful day too, not nice but it turned out well in the end, thanks again to our fantastic A&E. Thanks also to Steve Hollis for sponsoring the beer, Craig Mckay for providing the Snickers Bars, Dickon Hepworth of Santa Cruz for giving the Water bottles, Carl Long from Hedcamz for the bags and stickers, Gary Rands from Nomad for stickers for the goody bags and Stay Strong for the wrist bands, I also put the frame savers and a few stickers in to pad the goody bags out a bit. Thanks also for the donation of raffle prizes by Steve Peat, Nick Bayliss at Royal, Paul Blower, Rob Warner, Rob (Stik) Clark, Mark Burton, and me again, but the biggest thanks to all you guys who turned up to give the kids chocolate at Christmas, well done, and see you again next year.